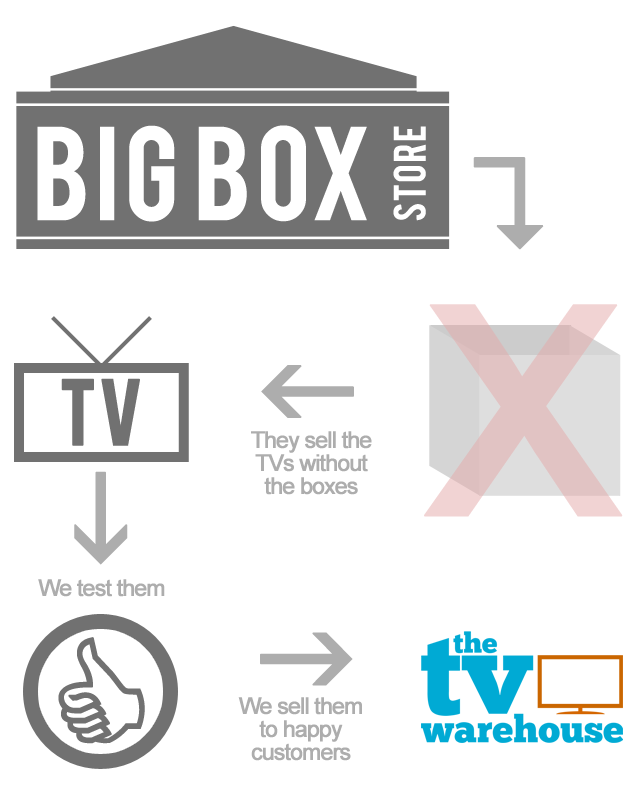 We are here to help you save money on your next television. We start by training our staff to be able to explain the latest technologies and jargon to help guide you toward the best fit for your use. The televisions we sell are usually considered "B-stock" which includes anything that is not considered new by big box retailers. This includes televisions that have been returned (open box), display models, repaired, scratch and dent, overstock, damaged packaging, etc and we are able to purchase at a significant discount over new units and pass the savings along to you. Each television we receive is individually tested to ensure that it functions properly and even minor cosmetic issues are noted so that you know exactly what you're getting. We fit people to TVs, not the other way around. Let us find the perfect fit for your home today! All of our products come with a satisfaction guarantee and warranty.